Nobody likes to watch aspiring pro players burn out. If you’ve been plugged into the League community at all for the past couple of days, you’ve probably heard the big news: the promotion tournament came, and the results were swift and terrible. Two major sports investors had put a lot of money into League, and both of them got burned—the Sacramento Kings and Schalke 04 in NA and EU, respectively. There’s been a lot of talk about the relegations and what they mean for future investment, and it’s a complex topic that I can’t possibly hope to cover in the space of one column. James ‘Obscurica’ Chen did a fantastic write up of the basics, linking to the various voices and their perspectives, and that’s a good way to look at the big picture—but I wanted to take a look at a smaller factor that’s having big contributions on how the promotion tournament and the long-term health of teams play out. It’s time to seriously talk about the Challenger scene and why, as Reginald says, it’s a scene that is hostile to long-term growth and opportunities. We’ve recently seen big changes to the way that challenger to LCS promotion is handled. Instead of the top challenger team automatically kicking out the bottom LCS team, the appropriate teams are put into brackets, seeded on their performance throughout their respective splits, and then pitted against each other. The survivors stay in the LCS, the losers go to challenger. This model is far superior to the alternative, and it’s already had massive positive results. Echo Fox is an example of a team that was stronger than their peers in challenger, memes about the roster aside. They earned their spot back. Both Splyce and Giants! Gaming in EU went from promotion tournament survivors to top tier teams. Even a team like Cloud9 Challenger can have significant positive results in the challenger ecosystem, even if there are questions about what comes after their win. The problem is that falling back into challenger can be a death sentence for LCS and challenger orgs alike. Hey, remember Fusion? A lot of the facts of Fusion were lost to time for most fans, and most of what survived was the details of their public relations campaign. Fusion was a team primarily composed of North American talent (they picked up EU import and technical NA resident Santorin at one point) who had their eyes on the LCS—and judging on their promise that NA might win Worlds in two short years, the world stage as well. Fusion fell one game short of making it into the LCS, and disbanded afterwards. Dream Team, another collection of North American talent, fell to Cloud9 Challenger and disbanded. I could fill this column’s space with nothing but stories and names of rosters who couldn’t survive being in challenger. It’s heartbreaking and, well, not fun to watch a team fight through the challenger circuit and then burn out. If the original Cinderella story ended with Cinderella going back to her stepmother’s and going back to scrubbing the table and sweeping the hearth, no one would be that interested in watching the next set of fairy tales. Challenger interest is low, and fans have learned to emotionally invest in a team at their own risk. So, what’s the alternative? The best case scenario is that challenger really becomes a place where players can grow and evolve, where pros can mentor young teammates and teams can spend a split or two figuring things out before getting ready to head onto the big stage. The previous issue was that challenger teams would unjustly make it to the LCS, and then struggle to survive, while LCS-calibre teams bled out in challenger. Riot has solved half of the issue with the challenger changes, but the other half still remains. 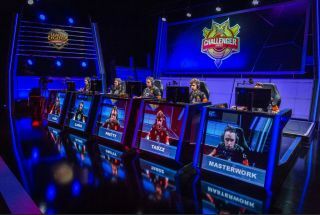 Challenger is a no man’s land, where teams assemble, make their run, and hope for the best. There have been glimmers of this best case scenario. The promotion tournaments have showcased challenger talent and shown some cool, exciting, close games that people can get invested in. The problem is that this hasn’t proven sustainable, so far. Teams like TSM have invested in challenger talent, only to have to pull out. Teams fall apart. There are glimmers of greatness, but getting them to line up, and keeping them sustainable? We haven’t figured that out yet. Schalke 04 have admitted to their mistakes during their LCS tenure, and will be spending time in challenger to sort things out. NRG haven’t confirmed the same, but they’ve hinted at it with a tweet. Will two major sports organizations be content if they don’t see an immediate turnaround, though? What of all of the teams who aren’t backed by big money, and their challenger dreams? Ultimately, it comes down to money, and while organizations like NRG and Schalke 04 are able to bleed for a split, what of organizations like Fusion, or NME? If the organizations aren’t the ones paying money, who is? There aren’t high viewership numbers, there aren’t sponsors—the sole source of money are investors, who are looking at the recent promotion tournament results and likely getting a little nervous. The solution is probably an intensive overhaul of the challenger system, and Riot hasn’t spoken about their plan for that yet. Chances are, it won’t be any one group that drives the movement, but the slow changes we’ve already seen will continue to gather momentum. That’s not a satisfying answer to the complex problem before us, but the truth is, the urgency is tampered by the fact that for the foreseeable future, there’ll be people willing to step up. Investors will keep putting money in the pot, players will keep playing for their shot at the big time, and the broken system will continue to limp along.